gun type spot welding machine manufactures in India. gun type spot welding machine manufactures in India. We make high performance, low maintenance, the robust and sturdy machine for India and export overseas. 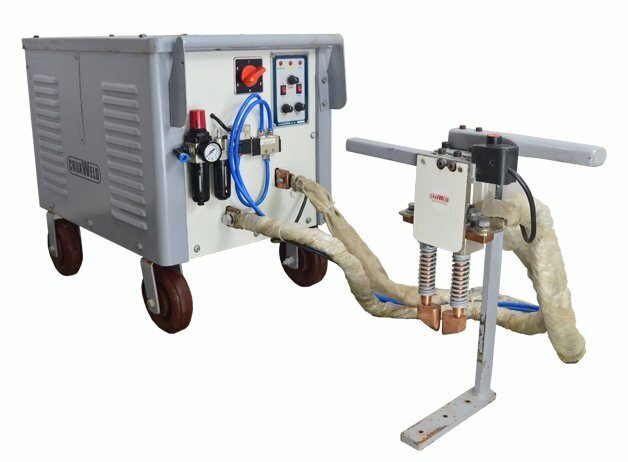 The gun type spot welding machine we produce machines with high electric conduction, excellent mechanical strength, easy maintenance, most reliable, durable, safe and flexible operation. These are suitable for welding lap point weld steel sheet, box bodies, the enclosure body of refrigerators, car bodies, washing machine etc. All the machines are provided with quality tested raw material for the manufacturing process. We have a team which is thoroughly dedicated and very experienced. They work regularly for the quality products and continuous improvement in our products and its quality. We keep an eye on the demand of the market and make continuous efforts to fulfill the need of the industries. We are always in the need of the challenge of new application and fulfilling its need for the market. The production unit is working tirelessly to make the machines with the best of quality and make the products in the shortest time for the industries. The industries are happy to get the best of products in shortest time thus taking care for the value of the money of our clients. The raw material, process of manufacturing, calibration of the process, reliability and technology make the machinery which is world class. We supply the machines in every corner of India but major states where supply our machines are Andhra Pradesh, Telangana, Tamilnadu, Karnataka, Maharashtra, Gujarat, Chattisgarh, and Haryana. The countries where we export our products are the United States of America, Saudi Arabia, Kenya, Australia, Srilanka, Bangla Desh. We are very concerned about the quality of our products so that our clients should keep us on our first list of priority as the supplier. The concern about the quality of our products and post-sales service make us visible amongst all in the market.